Seasoned chicken oven roasted to perfection. Serve it along side your favorite potato and veggie side. This dish is a perfect weeknight treat! Relatively simple to make, yet utterly delicious to eat.I make a lot of chicken. It is my other favorite thing to eat instead of pasta. I think I have made it in every way shape and form at one time or another. Yum! This looks delish! You have some great recipe ideas! I'm a new follower on GFC from Social Sundays! Have a great weekend! I'm making this soon. 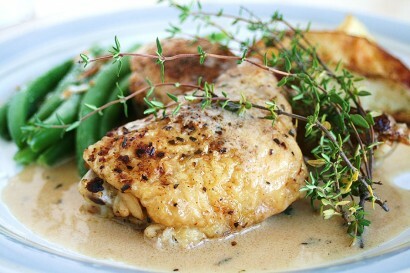 There is nothing I love more than a perfect chicken dish! I've still never used or tasted mascarpone cheese, but I think it's about time I do. This looks yummy. That looks yummy, could you substitute the mascarpone with low fat creme fraiche?